Original Content: Time Management Tuesday: Is The Internet Really Fragmenting Your Attention, Or Is It Something Else? Time Management Tuesday: Is The Internet Really Fragmenting Your Attention, Or Is It Something Else? 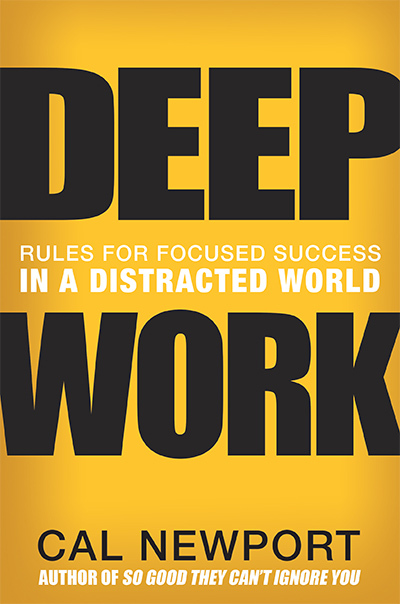 This week, we continue with our summer read, Deep Work by Cal Newport. Newport writes about "fragmented attention," which occurs when we are distracted, taking our attention away from work goals. Or, as he says, deep work, "Professional activities performed in a state of distraction-free concentration that push your cognitive capabilities to their limit. These efforts create new value, improve your skill, and are hard to replicate." For writers, that would be writing. Newport describes a study that "found that an interruption, even if short, delays the total time required to complete a task by a significant fraction." He makes very clear that he believes the Internet, and social media in particular, and e-mail are the big fragmenters of attention. He quotes another writer as saying, "Twitter is crack for media addicts." He calls one subsection of a chapter of his book "The Cult of the Internet." "Cult," like "crack," rarely has good connotations. Another entire chapter is called "Quit Social Media." I think that speaks for itself. I like the expression "fragmented attention." I think it definitely describes a real situation, the way our attention is broken by what is going on around us. In my experience, though, Internet-related activities just are not that big a fragmenter. A family member, who isn't well under the best of circumstances, became ill with a life-threatening condition and then suffered a stroke. She rallied. A sibling and I visited her skilled nursing facility daily, then slowly cut back to two to three times a week each. For a month or so I was reporting several times a week by e-mail to siblings on my visits. Other days, I received reports from the sibling doing the visiting. I was involved with a cousin visit. Because of our family member's impaired state, one of her hearing aids ended up on the floor of her room and was destroyed. This meant contacts with her audiologist, and a trip to the audiologist's office to pick up a new hearing aid and have it synced with her other hearing aid, so I was at the snf twice that day. During this time, a paperwork problem came up for my family member that was totally unrelated to her condition. This involved two calls to an attorney on my part. A call and stop on my husband's part. My sister then had to meet with another attorney, and the two of us ended up going into his office. An out-of-state family member was in town twice this summer. I visited another elderly family member a few times because her primary caregiver was sick. I caught whatever he had and was sick for two days. I've been shopping for both elders. I had to go to urgent care twice this past week for an unattractive skin infection that, thank goodness, isn't in a particularly obvious place. I had to drive a family member back to Vermont this weekend. As I mentioned here last month, this kind of thing has been going on in my family, to one degree or another, over and over again, for over ten years. The kind of family issues I addressed above are not unique to me. They happen to many people in all walks of life. Add childcare to that for those with children. For writers and other creatives, add day jobs. And, yet, it's the Internet that is so often targeted as destroying our ability to work. Life problems, not so much. Cal Newport is not the only writer to see the Internet as a major player in distraction or work problems. There's been talk of Internet addiction for years. Arianna Huffington writes frequently about our relationship with technology. (She has concerns.) Twitter and Facebook are routinely described as time wasters for writers. For everybody. I think there's a simple reason for this: A piece of writing on managing time or work that only points out problems and offers no solutions isn't going to be terribly useful or popular. The Internet, however, is a problem with a solution. We can grit our teeth and limit our surfing time during the workday. We can avoid Facebook or leave Twitter. We can schedule when we check or respond to e-mail. But most of us don't have what it takes to grit our teeth and ignore elderly, young, and ill family members. So Is It Hopeless, Gail? A dear family member has made it clear that my positive attitude is very possibly my worst trait. So, of course, I don't believe those of us with unending family problems are in a hopeless situation. Here's something interesting I've noticed: Last summer we also had family issues here...a surgery...an elder moving...a baby arriving and landing in the NICU. I ended up not working at all for a while. I haven't had to do that so far this year. I'm not working a lot, but I'm managing to get some things done. I have some thoughts about why that's happening, too. Mr. Newport makes a good argument. The magazines and the paper and the talking heads on the news say, "Kids these days! Always looking at their phones! Always on the internet!" and it becomes in vogue to blame social media for every ill when we've been a distractable species forever and remain so. Anyone with any connections or responsibility of care to a child or adult ends up with these attention fragmentations. Imagine if you're not privileged to be wealthy or well - mental or physical ill health and money problems take up so much of our consciousness. I think privilege is a huge factor in time management for work, whether you work in an organization or are a creative working for yourself. Some people in a company hierarchy have assistants/subordinates. It makes a difference. Some writers have financial support from family. We shouldn't pretend that doesn't make a difference. Many of the examples Newport uses in his book involve people in positions in which they can schedule chunks of time to focus on "deep work." That's not going to happen for just anybody professionally. And except for one mention of what he did when his son was napping on weekends, I don't recall any material in his book about people dealing with family responsibilities.